Putting on fancy headphones with your new iPhone or iPod while cycling on your brand new mountain bike across the beautiful countryside could be a truly wonderful experience. However, if you are cycling in pairs or in groups, you can’t share the joy with others if they don’t bring along their tiny gadget. Designed particularly to target cyclists or bike travelers, Podio is a small digital audio player featuring a built-in speaker which can be attached to the bike’s handlebars and broadcast a soundtrack openly for everybody’s enjoyment along the melodious journey. Weighing 139 gram, the tiny Podio is less than palm size and powered by two rechargeable lithium-ion batteries which can last a minimum of nine hours of use per charge. Users can load up to 2GB of MP3 or WMA soundtrack via USB connection to this music player. In terms of sound quality, the built-in speaker is able to pump out a thunderous 1.5 watts, loud enough to get a party started. Via the specially designed bracket, users can easily mount the device onto the bicycle’s handlebars. Alternately, due to its tiny size, users also can choose to hook it on the neck. There are still no pricing details available at this point of time. 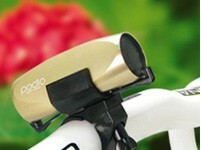 For an exciting cycling party, the Podio will take you places.